FOREWORD BY LIN-MANUEL MIRANDA AND LUIS A. MIRANDA, JR. The true story of how a group of chefs fed hundreds of thousands of hungry Americans after Hurricane Maria and touched the hearts of many more Chef José Andrés arrived in Puerto Rico four days after Hurricane Maria ripped through the island. The economy was destroyed and for most people there was no clean water, no food, no power, no gas, and no way to communicate with the outside world. Andrés addressed the humanitarian crisis the only way he knew how: by feeding people, one hot meal at a time. From serving sancocho with his friend José Enrique at Enrique’s ravaged restaurant in San Juan to eventually cooking 100,000 meals a day at more than a dozen kitchens across the island, Andrés and his team fed hundreds of thousands of people, including with massive paellas made to serve thousands of people alone.. At the same time, they also confronted a crisis with deep roots, as well as the broken and wasteful system that helps keep some of the biggest charities and NGOs in business. 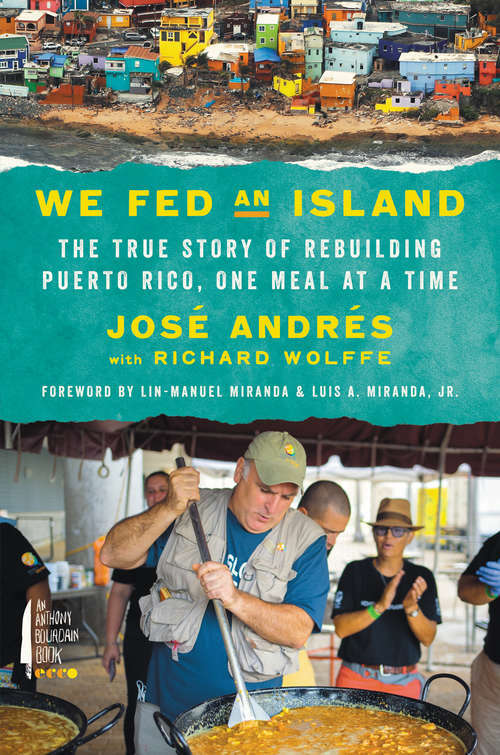 Based on Andrés’s insider’s take as well as on meetings, messages, and conversations he had while in Puerto Rico, We Fed an Island movingly describes how a network of community kitchens activated real change and tells an extraordinary story of hope in the face of disasters both natural and man-made, offering suggestions for how to address a crisis like this in the future. Beyond that, a portion of the proceeds from the book will be donated to the Chef Relief Network of World Central Kitchen for efforts in Puerto Rico and beyond.